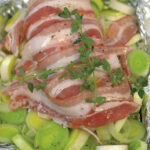 Make this recipe for one in a snug-fitting baking dish or to save on washing-up, a little tinfoil tray. Put 1 chicken breast, skin removed, in a bowl. Trim and wash a large leek, remove the outer leaves, then slice it into 0.5cm/¼ inch pieces. Add these to the bowl with the leaves of a few sprigs of fresh thyme, a good glug of olive oil, small knob of butter, a pinch of sea salt and freshly ground black pepper and a small swig of white wine and toss together. Try and bend the sides of the tray in towards the chicken so the leeks don’t burn during cooking. Drizzle with olive oil, place a couple of whole thyme sprigs on top and cook in the middle of the oven for 25 to 35 minutes.